“Sleep No More” is set in the 1980s and features an 80s soundtrack of vaguely familiar new wave music selections. A group of graduate students and their professor are conducting sleep deprivation experiments with an untested drug. When one of the test subjects goes berserk and kills himself in gruesome fashion the university shuts down the program. However, believing that they are on the verge of a breakdown, the group takes advantage of a two break in school to continue their work while the school is empty. The tests involve the administering of a drug which will keep the subjects awake for 200 hours straight, at which point they hypothesize that higher brain functions will kick in, permanently removing the need for sleep. As hours of sleeplessness turn into days, each of the students begins to experience horrific visions and waking nightmares as they each stalked by some nebulous, misty entity. But is this some supernatural phenomenon or just a trick of their drug skewed minds? 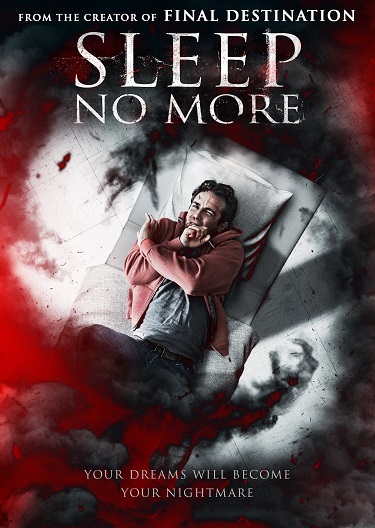 Over the years there have been a number of films like “Sleep No More” that explored similar themes. Director Phillip Guzman doesn’t add anything particularly new or interesting to the mix. Students take part in an experiment…students eventually fall prey to whatever their meddling dredged up. Guzman doesn’t appear to have had the budget for quality visual effects and thus has to rely on using this misty, foggy blog over and over along with color filters so we can see through the thing’s eyes…whatever it is. That takes me to another issue with the movie…It doesn’t provide any real answers and its message seems to be to leave well enough alone and don’t go poking around in the unknown. That might have worked years ago but movie fans are more demanding these days and thus Sleep No More is ultimately unsatisfying. On the positive side the performances are better than expected from a low budget horror. While the characters are 80s stock: funny nerd, former cheerleader, shy intellectual girl, strong, handsome leader, etc…they all do a fine job in making their characters unique and giving depth to what could easily have been cardboard characters. Sleep No More begins with a solid premise but just doesn’t hit the target and is short on scares. There are no DVD extra features.